We’d love your help. Let us know what’s wrong with this preview of Counting Kisses by Karen Katz. along with this bedtime book, now in a sturdy format perfect for the youngest readers. To ask other readers questions about Counting Kisses, please sign up. This book is a great way to introduce numerical value numbers as well as number words. This book allows you to participate in reading with your child. You can act out the action on the pages and count while you are doing it. It is a great interactive book. I chose this book because I feel like when people don't know how to read to their child this book is an icebreaker to that. This book shows you what to do and how to do it all the while making reading fun. 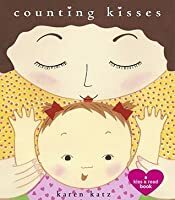 Sweet and cozy little story about all the kisses it takes before baby falls asleep--from ten little kisses on ten little toes to two kisses on each eye. It's nice as we see Mom, Dad, Grandma and Big Sis/Bro all showering the baby with love. I like this book as an interactive bedtime story. I would always give the number of kisses on the part of the body that they book describes. The author takes you through the day of a baby through kisses. My daughter's favorite was always "ten little kisses on baby's teeny tiny toes." It's a fun way to get toddlers and babies familiar with names for the parts of the body and counting to ten. Not my favorite, but better than others. There's the counting aspect and the body parts, too. It has a bedtime air in it, but I think it could work in baby storytime. Any excuse to give kisses to my little girl is welcomed. Plus it is a really good counting book. Some of the descriptive adjectives of the places to kiss your child were a bit much for me. A neat counting book, counting from 10 to 1. Little baby gets kisses from her loved ones. This is a sweet book to read with students at the facility students can think about the wonderful exeperiences they have at home with their love ones kissing them goodnight and showing them that they love them and will see them in the morning. It is also a good book to read with students learning numbers from 10to1. This board book presents learning numbers in a very colorful and sweet way. The main character in the story is a baby girl with brown pigtails and a pink onesie on. Throughout the book it presents each letter in order and every time the baby receives a kiss from her loved ones. This story teaches about family relationships, colors, objects, and numbers for infants and toddlers. One reason I did not like this book because it seemed very repetitive and lacked having a plot or a creative story. This book can be used to teach math and literature. It can teach children how to count. It counts backwards from 10-1. This book also uses a lot of adjectives such as: tired, little, tiny, squishy, chubby, loud, and pretty. It can also be used to teach verbs and nouns. This book spells out the number and shows the actual number so the child can learn how to spell numbers. Great for a babytime, with very little ones. Have parents give little kisses to their infant/young one as you read the descriptions in the book. Probably won't translate over to toddler or preschool storytimes very well, though. We're kind of obsessed with randomly yelling out body parts at the moment. Neck in particular is a favourite, so this was fun to read and point to our different body parts while mama counted and gave us kisses. Still not really on board with numbers so not sure what the fuss is all about. 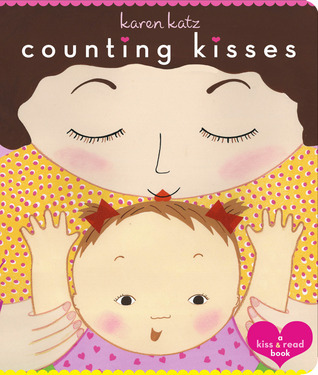 Counting Kisses by Karen Katz is an adorable book that was given to my baby girl before she was born. It is a great counting book for babies, and the illustrations are bright and colorful. 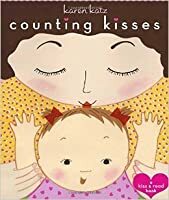 We read to our children before bed, and Counting Kisses is a wonderful way to calm down the baby before bed. I love the concept of this book. I also really enjoy the hearts that correspond with the number of kisses; that is a nice visual aid. I only wish this book had more diversity. a very sweet counting book. babies will love the kisses, even if they can't count them. This is a book about counting and helping young children count by using their body parts. I liked the numbers but the different kisses were not things I would do. Some of them actually seemed odd to me. I love the sweet nature behind this book. It is perfect for an interactive read with your child. You are able to count aloud and kiss the child following the book. Great book that one could add interaction to with a read-a-loud (kissing baby's feet, belly, etc.). Concept book for counting. Such a sweet bedtime story for little ones. Giggles, giggles and more giggles! The only thing I like about this book is the idea of counting and kissing your child. Besides that, the illustrations, the story, the colors did not convince me at all. Brief Book Summary: This story is about a tired, crying baby. In order to make the baby stop crying, the family helps by giving her kisses on different body parts. By the end of the story the baby is nice and calm and is ready to go to sleep. Here is an adorable book that would make a thoughtful gift for new parents or new grandparents. Although Baby may be crying as the story begins, there is a sense of peace and joy throughout. The precious little round-faced baby is tired, so Mommy dries those tears with kisses. First there are “ten little kisses on teeny tiny toes.” Daddy, Sister, Grandma, and even the cat and dog kiss Baby as the countdown proceeds. The descriptions are apt, as when the dog gives “six tickly kisses on baby’s dimpled-chin” and the cat licks “three fuzzy kisses on sweet little ears.” Finally Mommy gives one kiss on a “sleepy, dreamy head” and then, of course, it is time for bed. Every person and creature pictured is appealing and the story captures the feeling of the unconditional love that family members feel for a new baby. The author is a collector of folk art and the influence is clearly shown in this “kiss and read” book, which has now been converted into board book format. How many kisses does a tired baby need? “Ten little kisses on teeny tiny toes… Nine laughing kisses on busy, wriggly feet…” and so on down to “One last kiss on your sleepy, dreamy head.” Dressed in candy-colored pastels and sweetly patterned color blocks, this “count and kiss” countdown book for tots illustrates kiss after kiss in a new board book format. The generous dimensions (approximately 7” x 6”) and thick, sturdy pages (3/4” thick altogether) make this more attractive than many others 1-2-3 board books adapted from picture books. The transition is a graceful one, and, in hindsight more natural than the larger, thin-paper original edition. Response to Two Professional Reviews: Both reviews seem to greatly enjoy this book. They both touched upon the part where the mother gives the baby a kiss on the baby’s “sleepy, dreamy head”. This shows the connection that the mother has to its baby and the loving relationship they maintain. Both reviews think this is a wonderful story to read to children. Evaluation of Literary Elements:Characterization in this story would be the family. The plot is minimal and the conflict would be that the Baby is crying, and the mother and rest of the family members want to help stop this crying. The resolution is all the kisses that the baby gets, and in the end the baby stops crying and is able to go to sleep. Consideration of Instructional Application:In the classroom, a teacher can hand out cut outs of a baby and the students can be able to draw different kisses on where the family members kissed the baby. Then they can number the different kisses, in order to learn their counting skills. I think this would help teach the students about body parts, counting, and the importance of love and affection. Very sweet book :) I think this is a good one to read to your kids and can be very interactive and make your kids really enjoy storytimes! A $7 book that I got for $1 at Walmarts Valentine's Day clearance aisle. I love how adorable this book is. I can't wait to someday read these books to my kids. I like this book and it helped me learn about body parts like ears. I'll be darned if I'm going to sit still for the parents to kiss all my toes individually though. And then the feet immediately after? How about a little creativity, author, like could we kiss my toes and then my elbow and then go back for the feet? Wait what we don't kiss elbows at all in this book, only knees? Really, though, this is a pretty good book and it has numbers and I like to point to the number when you say it! It's I like this book and it helped me learn about body parts like ears. I'll be darned if I'm going to sit still for the parents to kiss all my toes individually though. And then the feet immediately after? How about a little creativity, author, like could we kiss my toes and then my elbow and then go back for the feet? Wait what we don't kiss elbows at all in this book, only knees? Really, though, this is a pretty good book and it has numbers and I like to point to the number when you say it! It's a little strange how just a few of the pages have the words at the top. I like the ones that are a picture on one page of the spread and the words on the other page of the spread. It makes it easier to find the number. 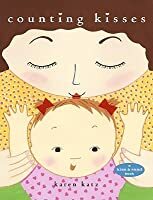 Karen Katz has written and illustrated many books for children, including The Colors of Us, Can You Say Peace, My First Ramadan, Counting Kisses and Where is Baby's Belly Button. Long inspired by folk art from around the world, she was inspired to write her first book, Over the Moon, when she and her husband adopted their daughter from Guatemala, and she wanted to tell the story of welcoming Lena Karen Katz has written and illustrated many books for children, including The Colors of Us, Can You Say Peace, My First Ramadan, Counting Kisses and Where is Baby's Belly Button. Long inspired by folk art from around the world, she was inspired to write her first book, Over the Moon, when she and her husband adopted their daughter from Guatemala, and she wanted to tell the story of welcoming Lena into their lives. Katz loves to paint and experiment with texture, color, collage and pattern. Besides an author and illustrator, she has been a costume designer, quilt maker, fabric artist and graphic designer. Katz and her family divide their time between New York City and Saugerties, New York.